Extra Filter included and 3 gaskets specialy made for this 6-Cup Espresso Maker ensuring delicious tasting coffee. When your filter starts deteriorating simply replace it with the new filter. 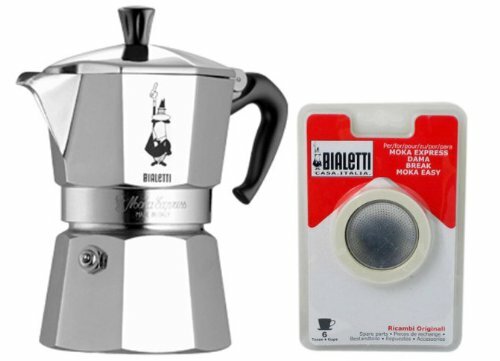 If you have any questions about this product by Bialetti, contact us by completing and submitting the form below. If you are looking for a specif part number, please include it with your message. Imusa Classic Aluminum Stovetop Espresso Coffee Maker/Moka Pot 6-cups. Bundled with a White Coffee Mugs Set of 4 Printed with the most Famous Cuban Night Clubs and a Chrome Rack.